A wildly inventive science fiction novel, originally published by Tor in 1995, long out of print, and now back, from Misenchanted Press, in a newly revised and expanded edition. Interstellar flight has been outlawed -- the great warpships that traveled between systems were found to be damaging the very fabric of the universe. Isolated by the ban, the Draconian system has become decadent, strange -- and foul. Dominated by corporate guilds called "bods," Draconian society has built its economy on slavery and assassination. A former assassin, Magen, has rebelled. When her husband is taken by slavers, she sets out to do whatever it takes to get him back -- even if it means destroying the entire Draconian civilization! "A non-stop ride through a faster than light funhouse." "a swift moving imaginative debut..."
"Combining elements of space opera, action adventure, and hard sf, this tightly crafted story of revenge and redemption is a good choice for large libraries." "Hopen skillfully combines elements of space opera, cleverly drawn battle scenes, and metaphysical speculations on the power of faith -- all without pausing a single step in a storyline of unrelenting action." 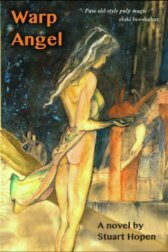 "...the book can be enjoyed for its philosophy or its physics, or even its great physical descriptions...."
"Warp Angel is continually surprising; Hopen's imagination is staggering. This is a book most people will enjoy, and no one can ignore." "A crazy space opera with a serious core." "...a tour-de-force... At every turn there are new wonders, fresh imagination and enough action to please the most pulpish reader. Hopen reveals himself to be a subtle and impressive thinker, as well as an inventive and enjoyable yarn spinner." "A gonzo ride through the assorted planets of a baroque solar system... filled with well realized exotic characters and crazed cultural details... It's easy to imagine [Hopen] evolving into a major talent. It's just as easy to imagine him burning out." You can learn more about the book's history here. The trade paperback edition is $18.95. The rack-sized paperback is $10.95 and only available from Lulu. The trade paperback edition is available from Amazon Barnes & Noble, and it can be special ordered by traditional outlets -- the ISBN is 978-1619910232.